The PDF link is to the published book; the HTML link is to the current Berkeley Logo manual (HTML and PDF). This project is an implementation in Logo of the often-needed utility program to find the changes between two versions of a file. This project deals a simulated deck of cards and allows the user to play a game of solitaire. The program checks for legal moves and displays the board layout. This project is a first look at what it means to compile a program. It's simplified because it translates BASIC programs into Logo, rather than into machine language. But it introduces the ideas that will return in more realistic form in the third volume. This program looks for patterns in a list. It can be used, for example, to recognize particular types of English sentences. This project uses the pattern matcher to carry out a conversation with the user, pretending to be a psychiatrist. 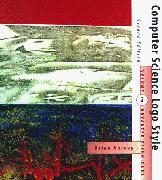 It is a Logo version of a program originally written by Joseph Weizenbaum. This project is a tool to assist the user in solving cryptograms (simple substitution ciphers). It makes some guesses automatically, and records other guesses made by the user. This program displays graphs of the Fourier (harmonics of sine waves) approximation to a square wave. It illustrates how harmonics are combined to control the timbres of notes in computer-generated music.